Delivery Hero has been offering POS Integrations globally for more than 3 years. With more than 100 integrations and 1000s of branches connected worldwide, Delivery Hero is the market leader integrating with the food space. Our API is flexible, which means you can code in a language that makes sense with your core systems or POS infrastructure. We send you orders and you translate them on your side so that it makes sense. Before you can jump into coding, you need to get the right credentials to talk to our systems. Developers should sign up below. PGP Key * What is it? Please select at least one desired platform. We offer integrations through two different flows. Direct integrations are only done with permission from the Delivery Hero platform on a chain per chain level. Indirect means that a physical restaurant will have a tablet with a dedicated Delivery Hero app for managing orders. Additionally, the POS system will also receive those orders through our POS module upon order acceptance. On the image below, components for a typical indirect setups are shown. A customer places an order at a restaurant for Alpha Chain on a Delivery Hero platform (e.g. Foodora). Foodora pushes that order to the restaurant tablet app. The order at this stage contains either expectedDeliveryTime, riderPickupTime or customerPickupTime. The restaurant manager accepts the order. The order is pushed to the middleware which forwards it to the plugin using the dispatch endpoint. The plugin performs as many calls as needed in order to dispatch the order to the API of POS Alpha. The Order reaches POS Alpha. At this stage, if POS Alpha has auto-acceptance, the order is synced on both systems (Foodora and POS Alpha). Otherwise the restaurant manager must accept the order on POS Alpha as well. As illustrated above, each chain communicates with Delivery Hero resources only through a plugin. The goal of this plugin is to adapt communication between our middleware and the chain API. The goal of the middleware is to integrate plugins with Delivery Hero platforms. Hence, every POS system requires the implementation of a plugin. The POS is only storing information on orders when accepted, the restaurant app is still handling the orders from start to finish. Multiple Delivery Hero platforms are supported and will be sent to the one POS ID. One integration should work globally on all Delivery Hero platforms. Notice that not all endpoints must be implemented. Many will not. 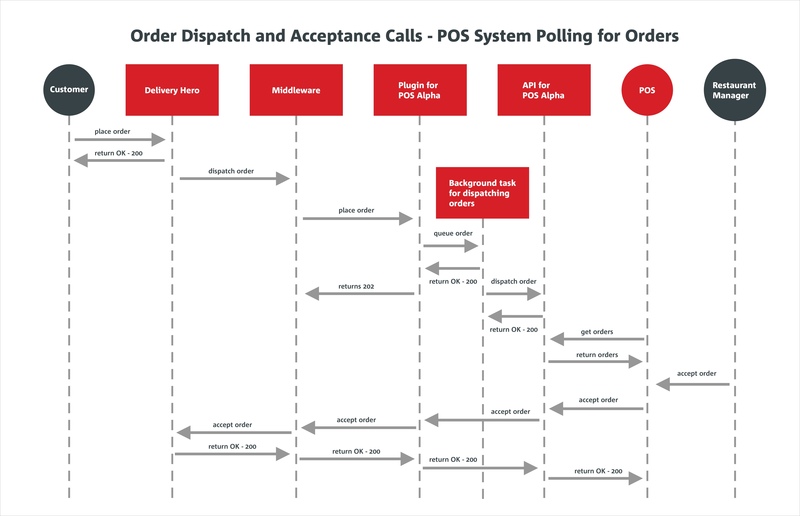 Order Dispatch flow documentation (seen below): the plugin developer has to decide which flow to implement based on the capabilities of their POS system. Only the order_accepted status update is allowed to be performed by the plugin (using this endpoint). All order status updates (cancellation, etc.) should be performed on the Delivery Hero Restaurant App. Direct means that physical restaurant will not have a Delivery Hero application. Instead, the restaurant will only use the POS system which is currently in the shop. As illustrated above, each chain communicates with Delivery Hero resources only through a plugin. The goal of a plugin is to adapt communication between our middleware and the chain API. The goal of the middleware is to integrate plugins with Delivery Hero platforms. Hence, every POS system requires the implementation of a plugin. Customer places an order at a restaurant for Alpha Chain on a Delivery Hero platform (e.g. Foodora). Foodora pushes that order to the Delivery Hero middleware. The middleware pushes that order to the Alpha plugin using the order dispatch endpoint described here. The Alpha plugin does as many calls as needed in order to dispatch the order on the Alpha chain using the Alpha chain API. Ability to manually accept and reject an order at the restaurant. When accepted, a delivery time is sent (non-foodora) can be via algorithm or manually sent. When rejected, reason is given (based on the platform). When an order is ready to be picked up by the driver, Delivery Hero is notified via manual button push or algorithm (non-foodora). If the POS is unreachable by the POS provider/restaurant, an unreachable status is sent to Delivery Hero (backchanneled using POS ID, not the order). Vice versa, when POS is back online a reachable status is sent. In some cases additional requirements are need and based on the platform's support capabilities. The more a POS integration supports, the greater access it has to the Delivery Hero network and restaurant base. Ability to mark that the restaurant is closed/busy for X amount of time. Ability to mark certain items on the menu are unavailable or available again. Ability to mark that the ETA of a certain order is delayed. Notice that not all endpoints must be implemented. Delivery Hero can update menus on our side with corresponding IDs for products defined on the chain or POS side. This is flexible and can be defined completely based on your requirements. Should your menu be updated or changed, you would be expected to ask for this field to be updated as well. The following describes the building of the plugin, which translates incoming orders to a language understandable by the POS system. The url of the plugin must be behind a secure https certificate. The Middleware sends a JSON Web Token (JWT) in the Authorization header on all requests to the authenticated area of this API. The Middleware generates a JWT with a shared secret, which the plugin uses to validate the signature of the JSON Web Token. The shared secret will be provided by the Delivery Hero Integrations team. If a request to the POS provider fails or is not available, the plugin must return a 502 with the error code POS_ERROR. On the other hand, internal application errors on the plugin should return a 500 with the error code INTERNAL_ERROR. The Middleware forwards orders from Delivery Hero to the plugin developed by the 3rd party. Oauth2 - the client credentials flow is used for authentication https://tools.ietf.org/html/rfc6749#section-4.4 . After a successful login the plugin is given a JWT as a bearer access token. That JWT should be used on all subsequent authenticated request in header Authorization: bearer the-token-you-got. Please keep in mind the token expires after the time specified in the login response expires_in. Notice that if the payload to the Middleware fails or is wrong it will return a 400 with the error code INVALID_REQUEST. On the other hand, internal application errors should return a 500 with the error code INTERNAL_ERROR. How you receive an incoming order. There are two kinds of orders, delivery and pickup orders. A delivery order has a delivery object containing data about the delivery address details unless it is an order delivered by a Delivery Hero entity, while a pickup order contains data about the pickup details. The middleware calls this endpoint to dispatch an order. The plugin dispatches the order and returns a 202 http response code. When the status of the order changes then the plugin calls the middleware. Others: Order will be marked as dispatch_error on Delivery Hero. A call center agent might handle the order and it could be dispatched again. This response code has the same effect as if you send the dispatch_error as a status change. The message given on this response will be available to the platform. Endpoint for managing order statuses on the POS side. Right now it is only used to get cancellation requests from the platform, logistics or by the user via the Delivery Hero software. This is used to authenticate into the middleware. Status updates are used for integrations where no software from Delivery Hero will be used. This means an order is sent from a platform and then directly pushed to the POS. Initially, after the order was sent from the Delivery Hero system, this endpoint has to be called by giving any of the following statuses: order_accepted, dispatch_error, order_rejected. dispatch_error should be used whenever there is some issue on the POS provider side (or on the plugin side), which does not allow the order to be dispatched, although some platforms are able to resend the order in some cases (e.g. POS provider service down). On the other hand, order_rejected should be used whenever the POS provider explicitly rejects the order. This would mean that the order will NOT be able to be dispatched again. This endpoint is used to notify Delivery Hero when POS device gets online or offline. As result, respective restaurant will be taken on or offline on each of the DH platforms. Currently only Foodora platform is supported. Endpoint to inform about current POS availability (busy) status.